1) Is this an online or print newsletter or both? Therapy Newsletter is an emailed, video, print AND fax newsletter. No other newsletter service in the industry comes remotely close. Every 2 weeks, our system automatically sends out a newsletter to your patients and prospects with your contact information on it, and the sender information appears as your email and has your name (company name or personal name – your choice). The good news is that you can customize the frequency and choose to have it sent only once a month if you prefer. You can also customize all the content in the newsletter at any time before it is automatically delivered by email on the first and the third Monday of each month to your patients, prospects and referral sources by email. You also get a printable version of the newsletter, which can be printed and handed out / mailed to patients AND faxed to doctors. The content in both versions is the same, but the design is different, one is optimized for the internet, and the other is optimized for printing and faxing. You enjoy the benefits of an automated, effortless, done-for-you marketing system in which a team of 5 physical therapists go to work for you twice a month to write, edit and research images for relevant content with a ‘call to action’ to drive more patients to your clinic. 2) Can I see a sample of the newsletter that is sent out? In order to preview samples of the web-based newsletter (optimized for automatic email delivery every 2 weeks), please click on the links below. You will see samples of the different templates and layouts that you can take advantage of. You can make changes to every single component of the newsletter as a member – logo/banner, text, images, website links and more. You can even change the default content on the newsletter, add your own content or simply edit the content we write for you every two weeks. Therapy Newsletter is now available in VIDEO! No other newsletter service in the market comes close, since we give you a newsletter in emailed, video, print and faxed format. In order to preview PDF samples of the printer-friendly newsletter (optimized for printing and faxing), please click on the links below. When you become a client, you can login with your username and password and download fully customizable documents in Microsoft Word with new, updated content every 2 weeks. You can also use our on demand print center to customize these documents online and purchase print versions of your newsletter. You can convert these word documents to a PDF format, which can be uploaded to our system for one-click faxing to hundreds of doctors (at no additional charge). To download a PDF sample of the newsletter, please click on the links below. You’ll notice that our PDF newsletters have ‘fun’ content on page 2, which includes news, trivia, humor and crossword puzzles. Print newsletters are a powerful way to connect with patients, and we recognize the fact that newsletters should be entertaining to read, which is why our print newsletters are reinforced with ‘non clinical’ or ‘bonding’ fun content on page 2. Our internal tests have shown that a combination of clinical and bonding content has the greatest impact on your readers, since this reinforces reciprocal referral relationships and triggers increased distribution of your newsletter. Plus – Newsletters that contain varied content are an easy read for patients. The more your newsletter content is consumed, the higher the results will be. We spend a significant amount of time and resources to create content that is easy to read and encourages patients to call your clinic. If you’d like to learn more about our services, or pass on some information to your manager, please ask them to visit our website therapynewsletter.com or download our 4 page brochure and send it to them. 3) Is this a patient newsletter or a physician newsletter? This is BOTH – a patient and a physician newsletter. You get a patient newsletter, and you also get a physician newsletter every two weeks. In fact, you can use the patient newsletter with physicians using a powerful technique we have created for you, called the ‘physician profiling principle’. Using the physician profiling principle, you approach local doctors and offer to feature them in your newsletter as a preferred provider. This serves several purposes. You increase the distribution net – since the doctor will be happy to distribute it to his / her patients. With our proprietary technology, you can generate an unlimited number of newsletters featuring different physicians. Click here for to see the physician profiling principle in action. 4) I'm not good with the computer. Do you help with this? How can I make changes? Certainly! In fact, every component of your newsletter can be customized, from the header, title, logo and content. Every single thing can be edited with the click of a button. If you know how to use Microsoft word, you will be able to customize the components within minutes. If you run into any trouble, you can email our support staff or we can walk you through the process over the phone or you can watch our comprehensive video tutorials in the member’s area. 5) What are the advantages and disadvantages of an online newsletter, compared to one sent by regular mail? The good news is that Therapy Newsletter allows you to have an email and a print version (both versions are created with unique, eye catching designs and content) every 2 weeks. This is a combination of print, mail, fax and email newsletter, all rolled into one. Having said that, there are certain advantages to an online newsletter that help you grow your private practice. The use of email is growing in the United States, and across the world. Most patients have an email address. In addition, many patients check email at least once a day, if not more often. As long as patients have given you permission to contact them, email is the easiest, fastest, most efficient way to maintain contact. This means that your message will be read by most of your patients! This makes a newsletter a powerful marketing system – more effective than phone calls, postcards or seminars. You can reach everybody at one time, and present high quality, valuable information to patients while positioning yourself as an expert. Your patients will gain access to more information about your clinic, services and other information by simply clicking on a link in your newsletter. This allows you to strategically build trust and loyalty with patients. Over time, the benefits of frequency (twice a month) are exponential rather than linear. Cost and Effectiveness. A newsletter that is delivered via e-mail is less expensive to deliver, faster to transmit and guarantees a high exposure rate, as compared to regular snail mail. Having said that, it’s best to follow the ‘balanced distribution’ principle = 30% emails, 30-40% printed and mailed newsletters and the remaining 30-40% reaching patients in the offices of their physicians using the ‘physician profiling’ principle. These strategies, and other advanced, under-the-radar strategies to leverage your newsletter are explained in our exclusive tutorial videos for members. 6) I am in the process of setting up my website. Should I buy your service now or later? I don't even have an email list of patients. What should I do? You don’t need a website to use Therapy Newsletter. The longer you wait, the greater the chances are that another therapist in your area will start using the newsletter to reach your potential patients. 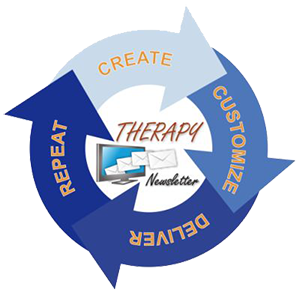 This is the fastest way to add subscribers to your Therapy Newsletter database. When you enter the patient’s email into your Therapy Newsletter account, they automatically get emailed these books; – you don’t lift a finger. You can even customize these books with your own contact information. You are creating a database of patients who will regularly receive your newsletter. Just imagine the possibilities as your list of patients grows and every single patient receives your newsletter twice a month! We have already done the work for you, and have four easy-to-use “patient stimulator” eBooks available for your use. You can customize these books if you like, and can offer them to patients as an incentive to becoming one of your subscribers. Even if you don’t have a website, you can sit back and relax while Therapy Newsletter builds your patient loyalty and referral base for you. 7) On which day of the month and how many times a month is this newsletter delivered to my patients? Your newsletter will be automatically emailed to your subscriber list on the 1st and 3rd Monday of every month. This is called the “delivery day”. 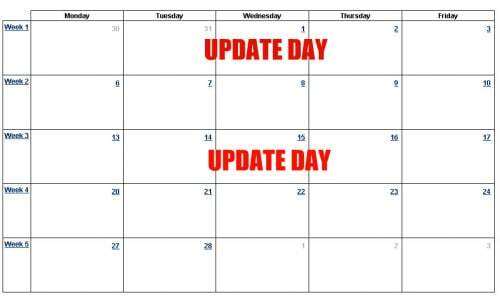 As a user, you login to your Therapy Newsletter account on the first and third Wednesday of each month (these days are called the ‘update days’) and can access your newsletter, which is scheduled to go out on the next delivery day. You can control everything – the content, frequency of delivery and the message in the newsletter. Note. Once you customize your newsletter in the beginning, you don’t ever need to login to the system again. You don’t need to login during the update days, because the system will simply update the content section, and your contact information, images and logos remain untouched. This means that a new newsletter is generated every 2 weeks, and you don’t have to lift a finger, ever. This structure between the update days and the delivery days gives you almost 2 weeks to customize the content before it is sent out. You control the look, content and delivery. 8) How many subscribers can I have with my Therapy Newsletter account? You have a 5,000 subscriber limit with your account, and you can increase your capacity as mentioned below. – 10,000 maximum subscribers for an additional fee of $19.95 a month. – 15,000 maximum subscribers for an additional fee of $29.95 a month. – 50,000 maximum subscribers for an additional fee of $59.95 a month. 9) I would like to customize the newsletter and add my own views, articles, comments and tips. Is this possible? Absolutely! 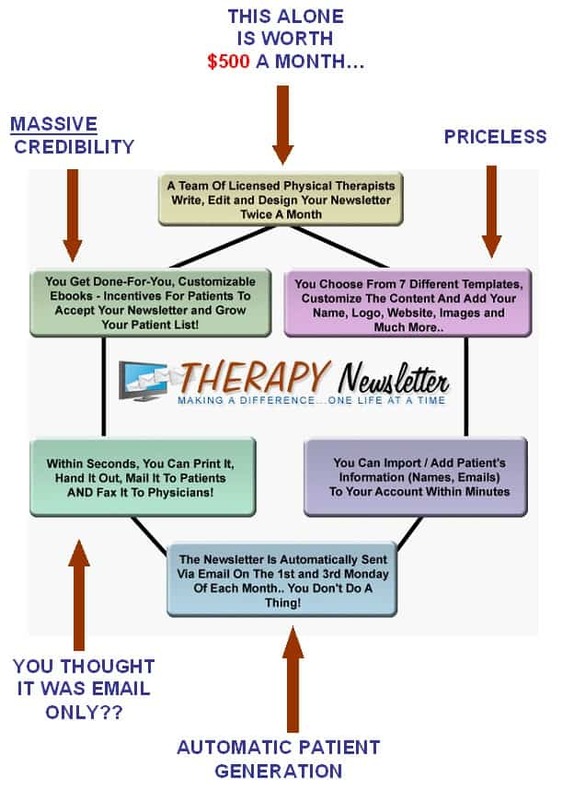 You have complete control over the content in your Therapy Newsletter. Our simplified web interface allows you to make changes to ANYTHING in your newsletter in seconds and preview the changes, print the new newsletter and even test drive the way it looks by sending a test email! In fact, we encourage your input, because it helps you to add your own unique voice to your emails. The more you customize your newsletter, the better the results will be. 10) I can probably write a newsletter on my own. Why would I need something like this? You are absolutely right. You can write it on your own, but there is a lot more to a powerful newsletter than good content. 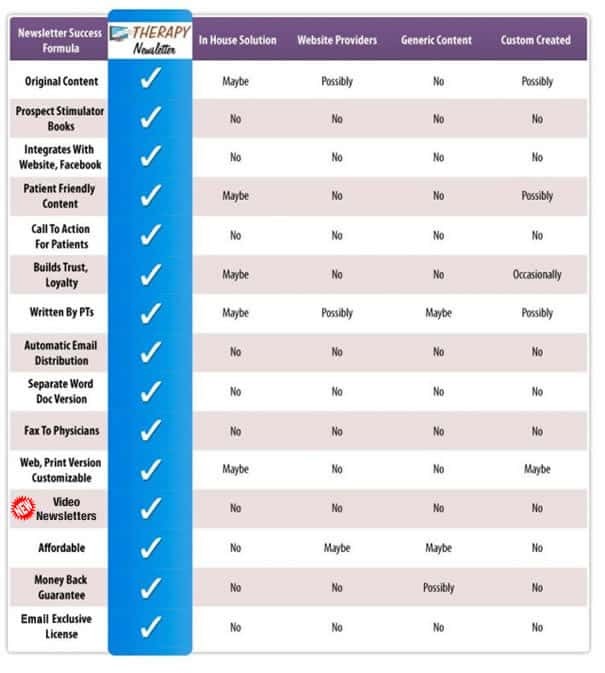 The comparison chart below will help you to make a decision. Writing a good patient newsletter, complete with flawlessly edited text, high-resolution images and ‘take home messages’ for the patient is the single most powerful marketing tool in your arsenal. In addition, when you include a ‘refer a friend capability’, customize the look and feel and deliver the content to patients and doctors every two weeks, you will get noticed by patients and doctors. We enable you to expand this idea not only to patients, but also to physicians and the local media. The problem is that, this is a serious investment of time, money and effort. You can hire a company like Therapy Newsletter to do all this for you for a fraction of the cost of manpower to write, edit and distribute the newsletter. Don’t forget, the Therapy Newsletter is action-oriented. On your behalf, we write the newsletter in a manner to encourage a call to action from patients – so they call you, helping you build long term loyalty, a new patient population and stimulating referrals across the board! We position you as a therapy leader in your community, automatically, twice a month. You save a significant amount of time and effort. You never have to write anything (unless you want to and have the time to), manage your subscribers, or deliver your newsletter. Every component, from writing and editing to formatting, design and delivery, is done automatically. 11) Is there really a chance I can get more patients using Therapy Newsletter? Our 30-Day money back guarantee says you can. Try our system for 30 full days and if you don’t like it you will get a full refund, no questions asked. It’s our way of telling you we KNOW this will work for your practice. Within 30 days, you will find that patients and physicians will start referring to you on a consistent basis. Your readers will feel like they know you personally. You will start to be recognized as an expert in your community. 12) I want to make sure the names and emails of my subscribers are protected. Are they? Email and information privacy is our number one priority. This system was created by licensed physical therapists and private practice owners who understand HIPAA laws and adhere to them as a strict professional standard. At Therapy Newsletter, we follow industry protocols for privacy and have acquired highly advanced secure server SSL encryption to protect you and your subscriber list. Our technology backend and information and email servers are overseen 24/7 by our technical support staff. 13) What is the cost of Therapy Newsletter? Is there a cancellation fee? The price for Therapy Newsletter is $67 a month, if you pay month to month. If you buy 9 months, you get 3 months FREE. The price for an annual membership is $603. You can try Therapy Newsletter for $1 for 30 days. If you’re happy, you’ll pay $67 per month after 30 days and you can cancel at any time. If you are unhappy for any reason within the first 30 days, you can send us an email or call us, and you won’t be billed further. Cancel anytime to avoid future billing. The competitive advantage you enjoy as a client is not only our ongoing content creation, eBooks and email technology, but also the email exclusive license. Please note that when you cancel, your email exclusive license expires, and your competitor may be able to add your patient emails to his / her account, and use the Therapy Newsletter to market to your patients. 14) How does the billing for the service work? How does the refund policy or the money back guarantee work? The advantage of an annual plan is that you can ‘lock in’ low membership rates and are protected against future price increases. In addition, the annual plan comes with additional features and bonuses including VIP account setup, logo creation and website integration. 15) Do I have to add my own photo? Am I able to use my company logo instead? Yes, you can replace your photo with a company logo. Our terms and conditions of use state that your Therapy Newsletter account can only be used for one location. If your company has more than one location, you will be required to purchase a separate Therapy Newsletter account for each location. The use of Therapy Newsletter by a corporate chain of clinics to send newsletters to subscribers in several locations is only allowed with a ‘corporate account’. Corporate discounts are available. Please call our office at 201-535-4475 or email support@therapynewsletter.com to learn about corporate pricing for three or more clinics. 16) Do my subscribers have the option to unsubscribe? This is, in fact, a federal regulation. To comply with local and international laws, we, as part of our commitment to quality, provide an “unsubscribe” link at the bottom of your newsletter and broadcasts. When your subscriber clicks on this link, they are instantly removed from your subscriber list and you will know who has unsubscribed. You can also remove a subscriber through your ‘add / delete subscriber’ section from your Therapy Newsletter member account. 17) Is there an advantage for me to sign up for the annual plan instead of the monthly plan? Keep in mind that the monthly plan is slightly more expensive than the longer term plans, and for good reason. To get best results, we suggest the annual plan, which gives you the opportunity to build credibility with your subscribers over a period of time. Having long term customers also allows us to focus on existing customers better, hence the deep discount with the annual plan. The best part is that you can also ‘lock in’ low membership rates, and are protected against future price increases. You will be ‘grandfathered’ into your payment plan as long as you choose to remain a member, and will be able to enjoy the benefits of our technology, plus all the new features and enhancements that we are constantly adding, at no additional charge to you. Our current pricing plan is as follows. $67 for a month to month plan. If you buy and prepay for 9 months at $603, you get 3 months for free. Therefore, the annual plan, costs you $50.25 a month, which is a significant savings.